As Interbike kicks off you’ll see a slew of both mainstream as well as smaller companies try and get your attention with new products. Some of these will be products that you genuinely find useful and plan to buy, and others will just be ones you sit and marvel at with either fascination or child-like intrigue. 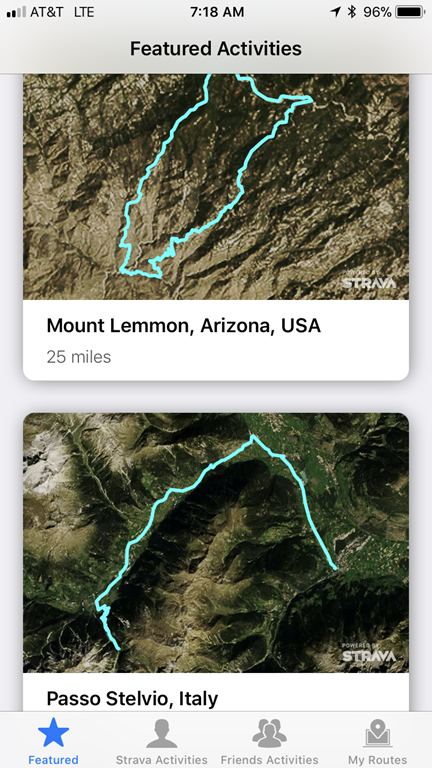 It’s that second emotion that covers a new app released today for Strava that allows you to see your Strava workouts and routes in augmented reality. For those not familiar, augmented reality is roughly when your camera (or a camera) is pointed at the environment around you and then the phone/computer overlays data on top of it. 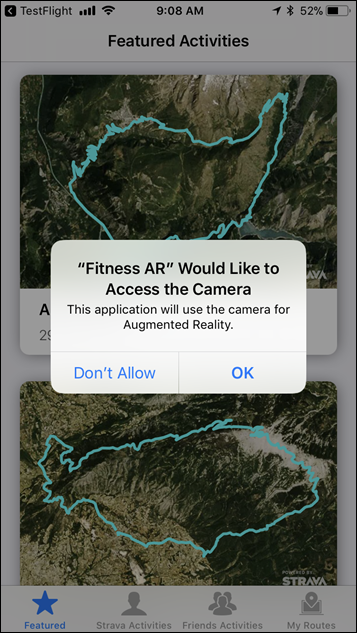 For example, it could be holding up your phone at the top of a chairlift and having the ski runs overlaid onto the terrain around you. As you turn the phone, the labels ‘stick’ to the terrain. With Fitness AR, a secondary company is leveraging a combination of Strava’s API’s and Apple’s new ARKit technology. As such, this app is only available on iOS. Once you launch the app, you’ll see it’s pretty simplistic. Down on the left side you’ve got some sample routes you can load up from exciting places. This is notable if you happen to live in a terribly flat farm locale and don’t want the most boring demo ever. 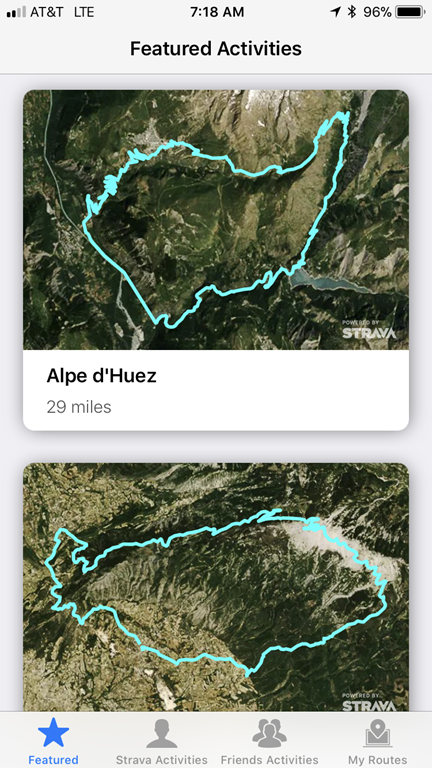 Alternatively, you can link up your Strava account to view your own workouts, routes, and friends’ workouts. So I did just that. Because I wanted something exciting, I went with this Swiss Mountain ride one from a week or so ago. You can see my whole post and video about it here. It was epic. 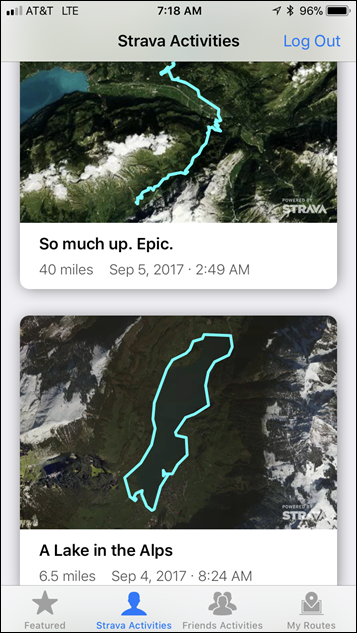 Now the app will ask me to place the map somewhere. The first time I did this I just tapped the screen, and that looked kinda silly with the mountains floating in mid-air. So I’d recommend placing it on a table or something, it’ll look fitting that way. With that done, the mountains are rendered, as is my route. 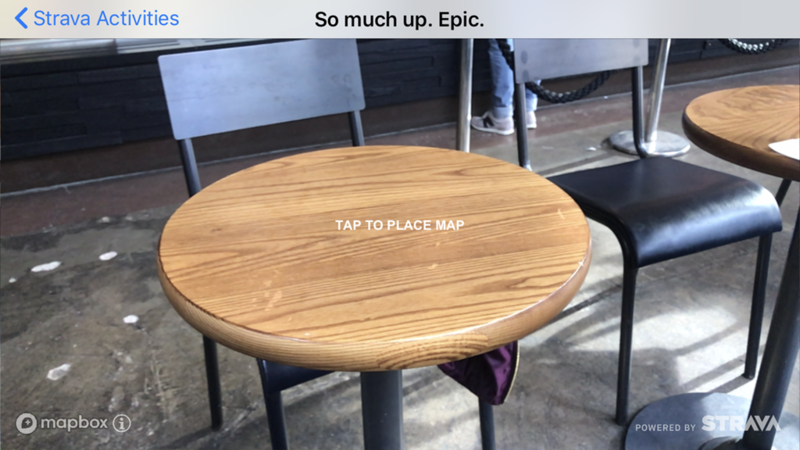 What’s unique here is that I can physically walk around the table, getting closer and further and the imagery zooms accordingly based on where I go and what I point my phone at. You can also pinch to zoom and rotate using your fingers as well. Further, you can then select your friends’ activities or your routes. Now of course, augmented reality is nothing new. It’s been around for years, despite various companies claiming they just re-invented the wheel. 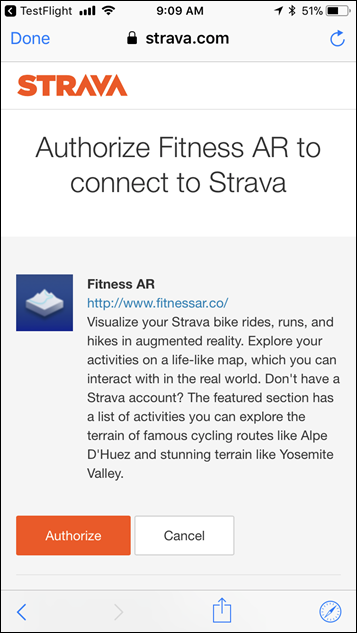 And of course, the ability to zoom around your Strava workouts has certainly been seen elsewhere. But it’s the ease to which this is now on your phone that’s notable here. In any case, I figured it’d be a fun little thing to talk about that didn’t require 18 hours to write an in-depth review. The app is available as of today from the App Store for $2.99. 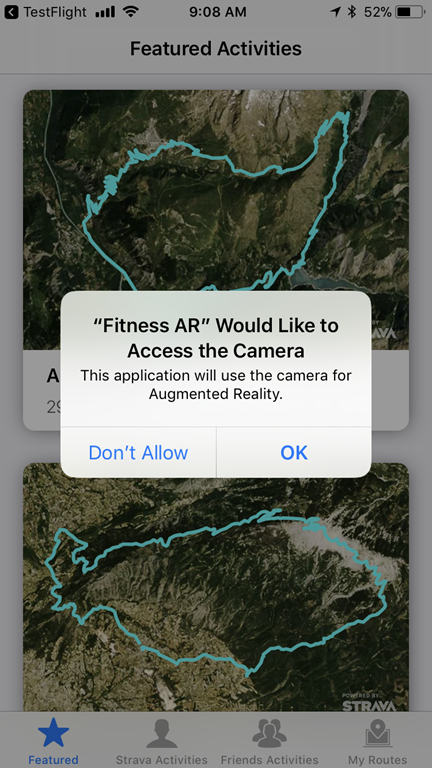 Note again that because it relies on Apple’s new ARKit tech, it’s not available for Android. 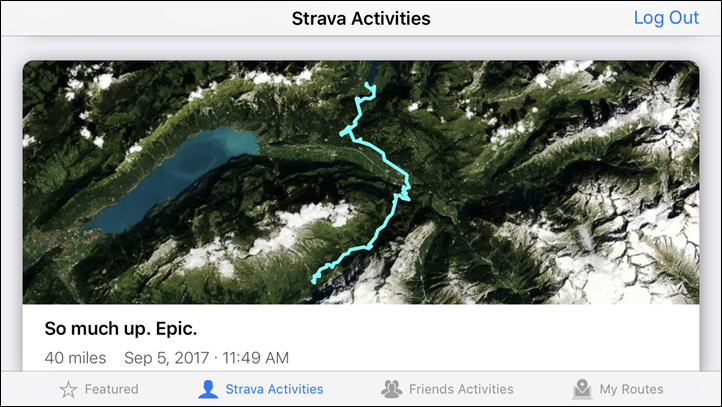 Also note that you can’t get mad at Strava for that, because it’s a 3rd party that’s making this app. They’re just leveraging the Strava API. Oh – speaking of which, you need iOS11 for this – so get your phone all updated! I’m not sure how often (or if ever) I’ll use the app again. But it was fun to poke around, and I’ve certainly spent $2.99 in far more frivolous ways. I’m guessing it needs the dual camera … 7 and above ? iOS 11 is probably the upgrade you need for this app. Yup, correct. No need for the dual camera piece (I just used a regular iPhone 7), but you do need iOS 11.
odd – restarted the app store and error message seems to have gone ? Admire your ability to shoot such a decent video at a random Starbucks! Not to dis on Ray’s mad camera skillz or anything, but the video image stabilization in the most recent crop of iPhones is amazingly good, especially considering how tiny the hardware has to be. Painfully funny fact: That was actually the third time I shot that video – fourth if you count another one I did sans-audio in Amsterdam. 1) Initial video/photos shot in Amsterdam Starbucks last weekend – but didn’t narrate video, so decided against it. Used photos for this post. 2) Shot another video in Vegas Starbucks early yesterday morning, but audio came out like crap. Decided against it. 3) Shot another video in parking lot of a closed Dairy Queen using the hood of my rental car as my table. Audio came out great, but video was a bit fuzzy. Discarded it. 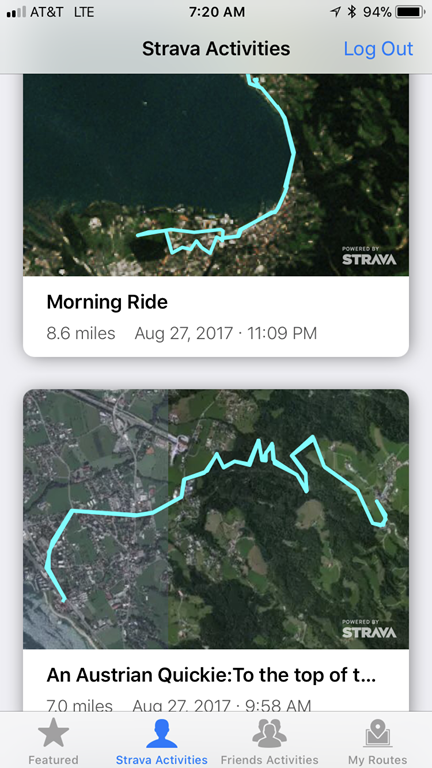 I’m hoping this will show the steep, punchy, terribly non-flat farm roads (10 to 20+% grades) around here. Pretty neat! It … umm… could use a little help, though. Several times my map on-screen puts me in the middle of dirt and I have to manage to either one-finger or two-finger move around to re-establish my POV. Then if I decide I want to pinch-to-zoom at all, it resets itself in the middle of dirt again and resets the zoom level. I can also just walk closer or further away to zoom in or out, but usually wish to zoom in more for close looks than walking would allow. Like Ray alluded, it’s more of a novelty. 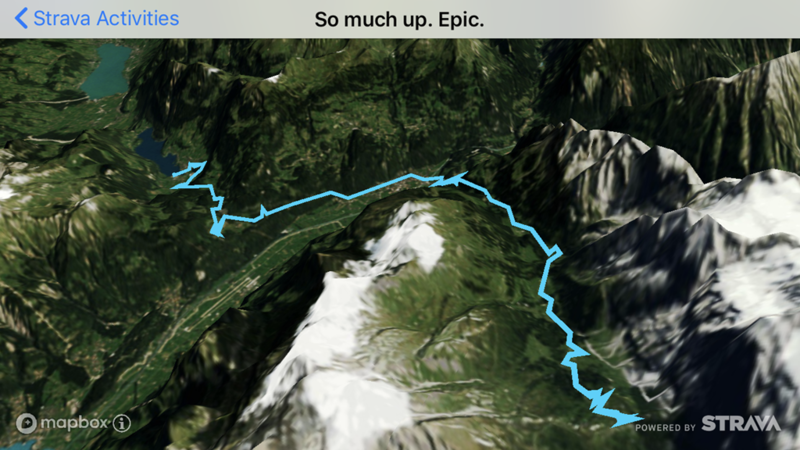 I may take a look at more epic activities as I complete them, but that’s about it. Here’s hoping that they realize there are seasons. I really hate looking at a cross country ski track displayed on a summer forest. Yeah, mine too – I don’t know if it’s just because the geography doesn’t have any extremes (i.e. mountains) so it just looks relatively flat (even though it doesn’t feel it when I’m cycling!). Bit disappointed really, not as immersive as I was hoping for without any Alpe d’Huez-style rides under by belt. I wonder if it does Zwift rides? Plus, for some reason it only shows the first 7 activities I ever logged on Strava, none of which were particularly exciting. I’m not even convinced that this app will get much in the way of updates, it’s really just a very simple AR demo that’s been developed to be part of the ARKit early goldrush. Not that I blame the developers at all, good luck to them. If only it was ok to use with a VR/headset? That’s the future! Got to be honest, when I saw the title, I expected some kind of KoM virtual partner to display on a device like Garmin’s Varia Vision. I could be climbing a hill, and see a Mario Kart style ghost riding a few metres ahead of me. That would be cool! I’ve rebooted the phone to see if that helps, but it did not. Weird. Oh, OK just realized 6 and 6+ are not compatible. My mistake! Your definition of augmented reality is not true. You described a smart video generator. The definition is in the phrase: augmented *reality* as in real, not recorded one. Such technology, seen in iron man’s movies, is existed in pilots helmets only. Beeing accurate is the most important thing to me, I really thought go gonna tell about a company that manage to deliver a true augmented reality experience, but got dissapointed. 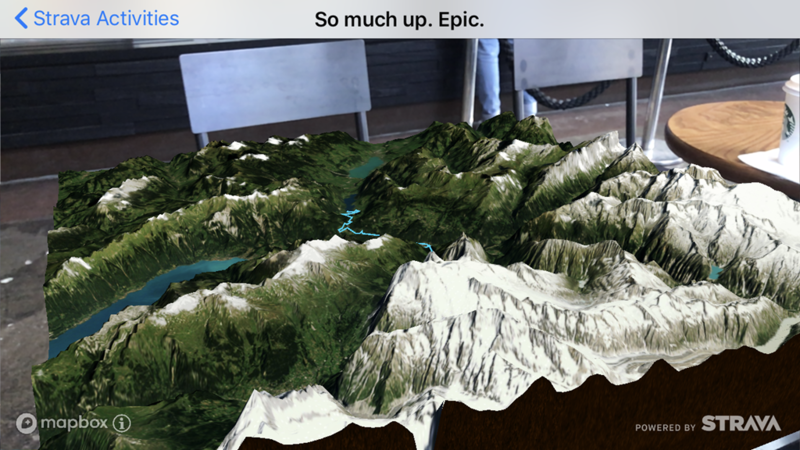 I’d argue that this is AR, not the 3D rendition of the ride itself (VR), but the way it maps that onto a table or other object. Not exactly exploiting AR to the full, but AR nonetheless. Indeed, as Neil says this is AR, just not VR. A lot of folks get those two mixed up. Just like people often mix up 360* with VR. There are layers of each technology, but this is as pure a definition of AR as you get. What do you use to record what’s on your phone screen? iOS11 now does it natively. You can enable it under Control Center > Customize Controls > Screen Recording. Then just swipe up and hit the dot looking icon. One tip is to ensure you turn on the ability to record sound if you want it (by default it doesn’t), though I can’t remember off-hand where the heck that setting is.